In the first years of the 1830s the city was edging northward into the pastoral area north of Houston Street. Streets were laid out and brick-faced houses constructed. In 1831 Thomas E. Davis built rows of fashionable Federal style homes on 8th Street, between Second and Third Avenues. To set the high-class residences apart, the block was renamed St. Mark's Place, after the Church of St. Mark's-in-the-Bouwerie two blocks away. No. 25, like its neighbors, was three stories high above an English basement, and three bays wide. The high dormers above the wooden cornice increased headroom within the attic level where servants slept. Costly features included marble trim; handsome ironwork in the railings, parlor floor balcony, and basket newels; and the carved Gibbs surround of the doorway. The mansion was home to the family of Isaac Quentin Carow. His French Huguenot family had escaped the persecution of Protestants following the Revocation of the Edict of Nantes in 1685. Once in America, they became Episcopalian. Isaac was born on March 29, 1778. At the age of 19 he changed the spelling of his surname from Quereau, reportedly much to his descendants' regret. He married Eliza Mowatt, his cousin, on June 30, 1803. The couple had eight children. Isaac Carow's library in the St. Mark's Place house was well-known. We can imagine that the furnishings and artwork were costly and refined. The family had barely settled into the house when the eldest daughter, Eliza, married her father's business partner, Robert Kermit in 1832. Kermit & Carow owned a fleet of shipping vessels and in 1835 would greatly expand the business buy purchasing the Liverpool-based Red Star Line of packet ships. When moneyed patriarchs of old Knickerbocker families formed the exclusive St. Nicholas Society in 1835, Isaac Carow's name was on the list of 275 invited to join. One of the conditions of membership was that one's family had to have been in New York prior to 1785. Mr. Carow was of a very retiring disposition and habits--yet of very clear perceptions and decided convictions--amiable and gentle, though with a short, quick manner occasionally, that might be taken for impatience, but for the kind smile which so usually accompanied it. The Kermit and Carow family names would be best remembered by historians in Edith Kermit Carow, who married the future President, Theodore Roosevelt, in 1886. Eliza died in 1837 at the age of 52. Isaac Carow lived on in the house another 13 years, dying on September 3, 1850. He was 72 years old. Charles King noted "at his death [he] left behind him no enemies and a spotless name." The Carow family quickly sold the house to James Thomas. But already the block was undergoing change. Several of what The New York Times said were formerly "aristocratic residences" were being operated as boarding houses. It was a fate that befell No. 25 by 1864. Furnished House Wanted--To May next; rent not over $250 per month; preferably from November, but not before October15; must have five good bedrooms. Address, personally or by letter, at 25 St. Mark's place. Five years later the house was on the market. An ad in The New York Herald on September 7, 1870 offered "For Sale--The favorite boarding house 25 St. Mark's place, full of boarders and paying well." Instead, the new owners, a couple without children named Boorman, resided in the upper floors and leased the basement level for Dr. Kennedy's drugstore. In 1871 they took in a roomer, but did not offer him the amenities of a boarding house, like meals. An advertisement for the "large, nicely furnished Room" on the second floor" was clear that it came "without board." Mrs. Boorman was looking for help in August 1872. She advertised for "A good girl; must cook, wash and iron; two in family; no objection to a colored woman." Earlier that year the Boorman's commercial tenant decided to retire, despite the four years left on his lease. Kennedy advertised his drugstore for sale, "with stock and fixtures complete." The term of the lease was included in the sale price. The Boormans were gone by 1890 when Nicholas Schultz moved his gold and silver leaf business into the building. Schultz, who lived in Bloomfield, New Jersey, made several changes to the building in the spring of 1896. The $3,000 in alterations--more than $87,000 today--included a handsome new cornice, updated lintels and scrolled aprons below the sills, updated late Victorian stoop railings, and a modern storefront at the basement level. When the Nicholas Schultz estate sold the property in 1915 it was described as a "five-story brick tenement with street stores and parlor store." Peter Marmer, who rented a room here the following year found himself in trouble when he voiced his unpatriotic opinions. The Lower East Side was the center of the anarchist movement and the 22-year old Marmer was swept up in it. On the night of July 24, 1916 he made an "open air address" uptown at 110th Street and Lexington Avenue. According to the angry crowd, he managed to "insult the flag, Government, and militia." Patrolman James O'Sullivan heard Marmer's incendiary remarks. He later said he was forced to "use his nightstick vigorously to fight his way through the crowd of angry persons in the audience aroused by the remarks of Marmer." His intentions were not to protect the firebrand from the crowd, but to arrest him for disorderly conduct. The crowd followed all the way to the police station but before O'Sullivan could get his prisoner inside, a 16-year old, Israel Cohen, "boldly" expressed that "the flag and Government and soldiers were good enough to protect American citizens, and Americans ought to protect them." The patriotic remarks enraged Marmer who broke free long enough to start a fist fight with the boy. Now both were arrested. When the judge heard the details, he let Cohen go. The Times noted "Magistrate Nolan, in discharging Cohen, complimented him for his patriotism." For a while--through 1919--No. 25 served as a Tammany clubhouse; then in 1920 became the Polski Dom Naradowy, or the Polish National Home. The basement level became home to Max Pfeffer's restaurant. 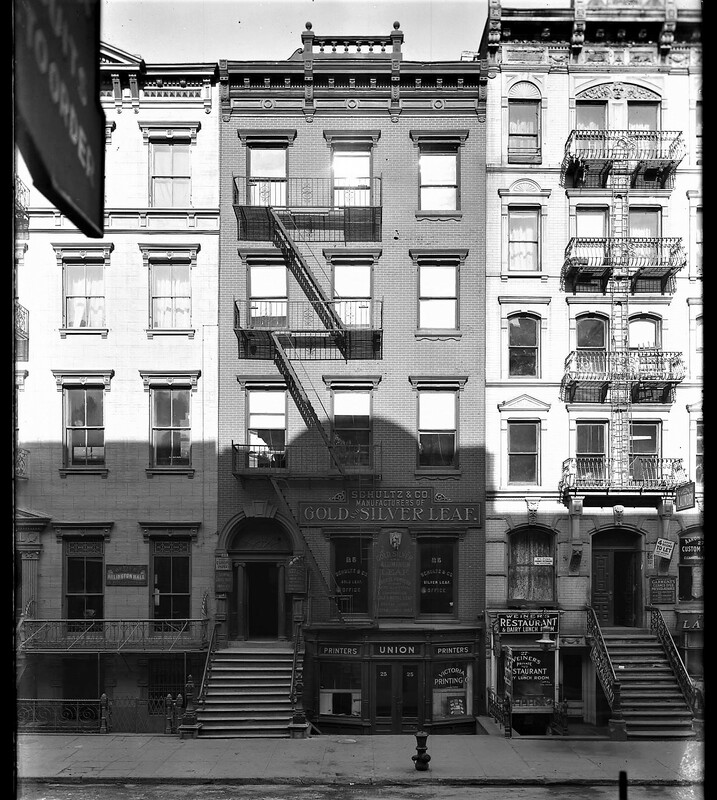 St. Mark's Place in the 1920s was far different from the elegant residential block in had been 90 years earlier. Gangsters and violent crime were all-too-obvious dangers. Late on the night of October 3. 1925 Pfeffer's wife took a large amount of cash--most of the day's receipts--to a night deposit. The cash register, therefore, had little money in it when six armed men entered at around 4:30 in the morning. The restaurant was full of patrons, The New York Times explaining that it "is a resort of waiters who work late at nights, many of them from hotels and restaurants in the theatre districts." The newspaper also noted that most of them "had with them their week's wages and tips." There were also several local businessmen in the restaurant. Paul Grimm, who managed Arlington Hall next door, had been aroused when one of the robbers headed up his stoop by mistake. He heard someone yell "Not there! Go in 25." He watched as the six men entered the restaurant. Suspicious, when no patrons came or went after the car pulled up, Grimm sneaked down to investigate without being seen by the getaway man in the car. The Times reported that he "saw the customers lined up against the wall, with their hands in the air." He hurried back to his office to telephone the police. He was no sooner there than the robbers rushed back to the auto. Hoping to alert foot patrolmen, Grimm fired two shots into the air. It was too late, though. The thugs got away with $9,000 in cash and jewelry. One patron, David Kranz, lost $210, taken from his pocket. But he was quick enough to save his diamond ring and pin by dropping them unseen into his hot cup of coffee. The girl behind the pie counter, Julia Kardos, had screamed and fainted when the robbers rushed in. The newspaper said "One robber, with a gun in his hand, went to her and seizing an open bottle of cold milk poured the contents on her head." The scene was replayed three months later on January 14, 1926. Six gunmen lined 200 patrons, all men, against the walls. While three held them at gunpoint, the others took their cash and jewelry. One patron dropped a roll of $200 on the floor and attempted to hide it under his foot. He was caught and received a hard punch in the jaw. One victim jumped out the rear window, falling 15 feet to the ground. He stopped when one of the robbers called out that he would shoot him. The thieves were not totally without hearts, however. When they took $40 from one man, he pleaded that his wife was sick and that was all the money he had. They gave him his cash back. Just as in the previous robbery, the men suddenly dashed out of the restaurant to the waiting automobile and got away. The Polski Dom Naradowy remained in the former house for decades and by 1945 the Polish National Council was headquartered here. Poles seeking asylum in the United States regularly appeared here, sometimes with heartbreaking results. Such was the case in 1949. Young sailors from the liners Sobieski and Batory had jumped ship in January and February. They were in danger of being turned over to police upon their return after spies among the crews had discovered their anti-Communist leanings. The sailors, all between 19 and 22 years old, pleaded for asylum "because they would be persecuted at home." The 20 seamen appeared at No. 25 St. Marks Place (the street name had lost its apostrophe by now) on March 17. It did not look good for the refugees, however. Federal Immigration authorities announced they would receive "expulsion hearings" and "if ordered deported, could appeal the rulings in Washington." The New York Times reported "Most of the seamen expressed their willingness to join the United States Army if they were allowed to remain here." The scenario would be played out again and again. In July 1958 24-year old Richard Eibel, jumped ship from the freighter Fryderyk Szopen at Port Newark. He got in touch with the Polish-American Immigration and Relief Committee on St. Marks Place. The Committee pleaded his case to Federal officials, saying his return to Poland would "most decidedly endanger his life because of his activities against the Communists and his family's social standing." But on July 25 Immigration officials tracked him down to the Polish National Home where he was seized and returned to his ship. Protests fell on deaf, impassive ears. John L. Murff of the Immigration and Naturalization Service pronounced simply that it was the responsibility of his office to see that foreign seamen were returned to their ships. Similar stories played out until the early 1960s when the Polish National Home left. The East Village was now the epicenter of Manhattan's hippie culture. The lower two floors of No. 25 became home to The Dom (a name conveniently lifted from the Polski Dom Naradowy name still painted over the doorway. The Inside Guide to Greenwich Village called it "a groovy get-together place for the neighborhood cats and chicks who dig dancing and Polish food." The Dom did not last long, however, and was replaced rapid-fire by the Balloon Farm and, in 1967, Andy Warhol's Electric Circus nightclub. Among the bands who played here was the Velvet Underground. Jack Newfield, writing in The Village Voice, said it was here "the New Frontier met the Underground." The Electric Circus closed in 1971 as the Rev. Joyce Hartwell was quietly buying up the neighboring houses. By 1998 she had assembled the four properties from No. 19 through No. 25, breaking through walls and establishing self-help, job training, and related spaces; as well as the Imami Cyber Cafe in the basement of No. 25. The alcohol-free, drug-free meeting space offered internet connections. Sadly brutalized, a hint of the 1831 gentility exists in the elegant doorway. Today there is little trace of the "aristocratic" residence of 1831. The marble stoop has been replaced in brick, the architectural details of the upper floors have been shaved flat, and a plate glass parlor-level show window sits above the modern basement storefront in the basement. Rather surprisingly, however, the marble Gibbs surround, painted a morbid black, survives, as do the Federal style panels and sidelights that once sat behind elegant fluted columns at the entrance.